Send in your gardening question and be in the draw to win! Each month Daltons will answer one of your questions – and if yours is pick, you win! Up for grabs this month? 2 x Daltons Premium Tomato packs. 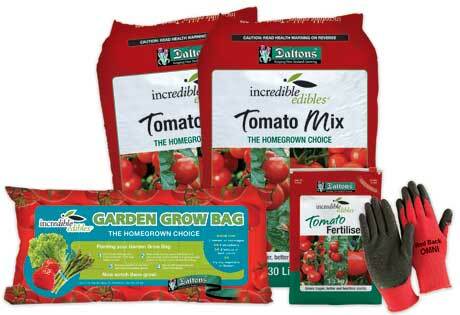 Each pack is valued at over $80 and contains 2 x Daltons incredible edibles® Tomato Mix, 1 x incredible edibles® grow bag, and 1 x Daltons incredible edibles® Tomato Fertiliser. PLUS a pair of comfortable, versatile Red Back gardening gloves from Omni Products. Don’t post your question here. HEAD OVER TO my other site SWEET LIVING for your chance to win.